A team of geologists from both Lancaster and Liverpool Universities will be carrying out geological sampling at various locations in the AONB and wider Morecambe Bay area this autumn. 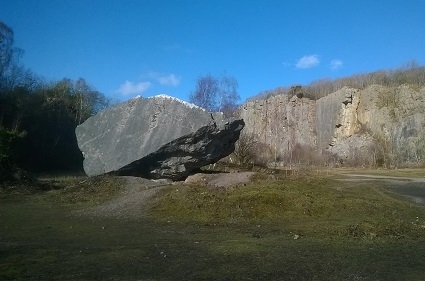 The research is being supported by The Geological Society, the International Commission on Stratigraphy, Natural England and the AONB Partnership. The magnetic field of the Earth is generated by fluid motions in the outer core. The strength of the Earth’s magnetic field varies over time, and is linked to these fluid motions. Knowledge of the magnetic field in the past can thus be used to get insight into the processes going on deep inside the Earth. It is hypothesised that there are long-term variations in the strength of the magnetic field, with a periodicity of 200 million years. In periods where the magnetic field is weak, the magnetic north and south poles reverse often. In periods where the magnetic field is strong, the field is very stable and hardly any reversals are present, these periods are called superchrons. An essential part of this hypothesis relies on the strength and number of reversals of the field in the Carboniferous. There are currently only limited records of the field in the time before the Permian-Carboniferous reverse superchron which lasted from 318 to 262 million years ago. The United Kingdom has an excellent record of sediments that were deposited around this time, but the Lower Carboniferous was heated to high temperatures in most parts of the UK, leading to loss of the original magnetic signal. The Lower Carboniferous in Cumbria and North Lancashire has not reached such high temperatures, and thus is very promising for reconstruction of the magnetic field. The geological sampling to be carried out will determine the polarity of the magnetic field through the Lower Carboniferous in this region, through the Martin Limestone, Red Hill Limestone, Dalton Limestone, Park Limestone and Urswick Limestone, from which oriented samples will be collected at approximately regular intervals throughout the Lower Carboniferous to estimate the reversal rates. Sampling will be conducted in a team of 2-4 geologists using an approved methodology. Hand samples (roughly 10x10x10cm blocks) will be taken from the rock outcrops with a hammer and chisel. Once the broken surface weathers like the surrounding rock, it leaves no evidence of a sample being taken. No sampling will be undertaken at locations where important fossils, palaeosols or structures are present and no drill cores will be taken. Sampling at Trowbarrow Quarry SSSI has formal consent from Natural England.